Twirling an overly blunt-tipped pencil, Ashleigh Trace sat by the banks of Euros Creek. Strong gusts of wind whipped at her back, sending shivers down her spine. Today was a rather odd day. Breakfast had exposed an awfully quiet side of camp that she, after all this time, never experienced. The noise of utensils clanging against the plate echoed throughout the Mess Hall, only occasionally accompanied by a murmur or two. Right after they diminished their food and offered some to the gods, a bunch of campers walked away in a rush; towards the direction of The Armory. Ashleigh had dismissed the vision when her eyes spotted the bustling crowd, but now it seemed to come back over and over again. Were they anxious for the war? Originally, she had come here out of angst. Angst for finishing a small tactic she had devised a week back. Though, the moment Ashleigh arrived by the water's edge, the battle plan quickly dissipated within the depths of her mind. Now she sat on the ground, five meters away from the gushing waters; doing absolutely nothing but twirling a pencil absentmindedly in utter frustration. "I hate this." For once she was not practising in the Arena. Slowly she walked onto the beach wearing some shorts and a shirt, she didn't wear things that would look 'hot' to other guys, especially if her brother, Jared came along. He was very protective of her. Her eyes full of determination to not fall yet not seeing. Her golden hair pulled back in a tight ponytail to it stayed out of the way. Her fringe clipped back so her vision wouldn't be troubled. Even though she had none. Emma pulled out her ponytail and shook out her long golden hair. Benny strolled along the edge of Euros creek, strumming happily at his guitar when a familiar cry burst through the silence. Benny turned, grinning widely as he saw his griffin companion soaring towards him. Lyon, the large, golden, mythical creature landed on top of Benny without a loud thud. "Ooaf!" Benny exclaimed, feeling the pressure of the large animal. "I think you need to lose some weight, bud. Been eating too many weasels?" the boy chimed. Lyon let out a squawk and nodded his feathery head. Benny sat up slowly, wriggling from Lyon' grip and rising to his feet. He paused when he heard a voice he easily recognized. 'It's that Ashleigh girl.." he thought with a small smile. Quickly fixing his black hair, he grabbed his guitar and strolled towards the voice. Lyon tilted his head, but followed. Benny glanced behind him, seeing the confusion in his griffin. Benny laughed, bringing his guitar forward and playing the chords from one of his own songs. As the two walked forward, they both swung their heads to the music in unison and stepped in rythym. Music. A familiar melody was being played on a guitar not far off. Ashleigh started twirling the pencil to the rhythm of the song, obviously with nothing to do. She watched as the yellow pencil rotated in between her index and middle finger. A boring and hypnotic cycle. Letting out a strong huff of air, she stood and brushed off dirt from her faded jeans. "Well since there's absolutely nothing to do-" Ashleigh let the sentence hang loose in the air, unfinished and empty. She bit her lip and walked towards the sound of the guitar, noting that it was heading her direction as well. "Who's there?" Ashleigh asked, tucking a stray strand of hair behind her ear. I'm in love with you,"
Benny happily sang along to his own song. His smooth, textured voice rang through the crisp air as he hummed and sang happily. He was so enveloped in singing, that he didn't even notice the voice that was calling to him. And Lyon was so happy about being with Benny that he didn't notice either. Benny plucked the string on his guitar and a wide grin stretches across his face. Benny and Lyon stopped walking to the rhythym of the song, spun around for effect then continued as though they hadn't done something so odd. There was an aura that radiated from these two, showing how strong and unbreakable their bond was. Ashleigh watched as the unusual tandem turned and walked along to the beat of the music. She herself wanted to tap her feet and start dancing, but that would be embarrassing beyond words. Children of Athena aren't really the best dancers out there, they would rather read about dancing than actually dance. "Nice song. I take it that's an original?" 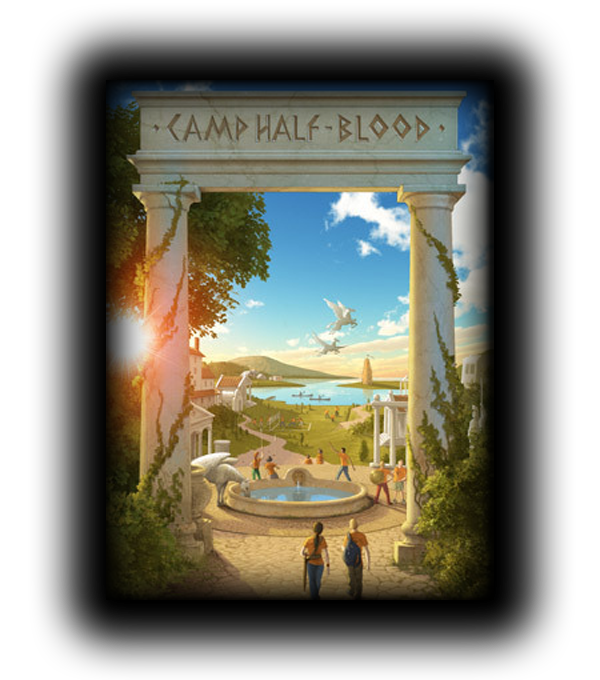 Ashleigh greeted both demigod and griffin with a nod and a small wave. The boy looked familiar...Benny, was it? And the griffin, she had only seen one in her dreams. So, obviously, she was quite fascinated when she saw the majestic creature. If her steely gray eyes could twinkle with wonder, they would be. "So, what brings you here?" Obviously that question had to pop up. Being a rather anti-social individual, Ashleigh did not know how to start a conversation. Benny stumbled forward, landing with a dull thud. He shot Lyon a glare, but the griffin only let out a series of squawks that could be classified as laughter. Benny rolled his bright, fantastically colored blue eyes. "Oh hey. You're that Ashleigh girl. I remember you," he said with a crooked grin. Rising to his feet, Benny brushed himself off and smacked Lyon playfully upside the head. The griffin narrowed his golden eyes, unflurring his large, majestic wings to give a flap of displease before the creature folded its wings once again. Benny rolled his eyes and nodded his head. "Yeah, it's an original," he said simply. Benny glanced around, swung his guitar to his back, and gave a shrug of his shoulders. "The quiet I guess. And it's a good place to play some music," he answered, giving a laugh. Lyon took a step forward, nudging Benny repeatedly in the arm with his beak. "Alright, alright. I'll introduce you. Don't get your features all twisted.." he said. Lyon gave a huff in reply. "This is Lyon, my griffin," Bemnt said simply. Lyon gave a graceful bow, which griffin often did. Benny rolled his eyes. "Oh stop trying to be fancy," he said. Lyon glared at Benny a moment before finishing his bow and rising up again. “Pleasure to meet you, Lyon.” Ashleigh said as politely as possible. Something about facing a griffin terrified and fascinated her at the same time. In fact, she was about to stretch her hand out for a shake. But then, realizing the stupidity, the thought of doing anything of the sort disappeared. Wouldn’t want those claws raking at her skin, even if it’s unintentional. And you’d think she’d easily get used to this mythological world. OOC: FAIL POST D8 I OWE YOU AN EXTRA GLAMOROUS POST. I couldn't have Ashleigh walk from the creek all the way to the beach. She isn't on the beach? ooc: *shakes head* They're at Euros creek. bic: Benny shrugged his shoulders with a smile. "I enjoy quiet...it's a time to relax. I never get that in my cabin...pretty loud in there," he explained. Seeing the obvious interest in the girl's eyes, Benny smiled. "You're welcome to come closer to Lyon...he doesn't mind," he said, patting the griffin's feathery head. People were always interested in Lyon...Benny had gotten used to being in the shadow of the griffin, so it no longer bothered him much. Bringing his guitar back to the front of him, Benny strummed the strings quietly. Lyon, however, took a step towards Ashleigh, tilting his head curiously as he waited for her response. Lyon understood everything demigods said, he just couldn't talk back. ooc: Here's a boring post as well xD Now we're even. Aw I'm sorry, Pink. Hope you're back soon.